On the bus from Berat to Tirana I was glued to the window. 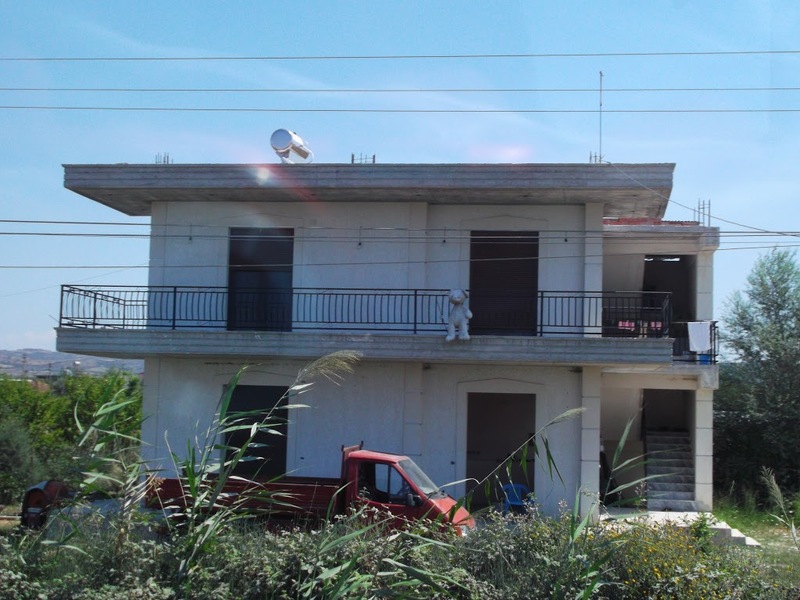 I remembered on the bus in to Berat we had passed a house that was designed to look like a boat and I wanted to get a picture of it. Unfortunately, though, I didn’t see it again. So I gazed out the window at central Albania and the burnt ditches, piles of garbage everywhere, bunkers and collapsing, crumbling concrete structures. I was terribly confused: about half of the houses had stuffed animals hanging from the balconies. I had no idea why, but as I found out later, Albanian families hang stuffed animals outside their houses as a way of warding off the evil eye. Berat to Tirana is only 100km, so I thought it would be a short journey. After about two and a half hours, though, I began to wonder if I’d gotten on the wrong bus. I was heading to the capital city, after all! Surely it didn’t take so long to get in to the capital from only 100km away! It was a maddening bus journey, and as the bus rolled slowly in to Tirana after three and a half hours, I got off the bus and decided to walk in to the center rather than sit in traffic. I wondered if I had made a bad decision, however, as I wouldn’t see where the bus station was. I walked around for a while and eventually, with the help of a flier I had found in the Berat hostel, found my way to another backpacker hostel. I set my bag down and headed out to explore more of Tirana. While at the kid’s camp in July we had had an electronic cezve, so I made myself an astounding amount of Turkish coffee every day. Three large mugs of Turkish coffee a day, which probably works out to be about nine or ten regular sized Turkish coffees. Most of the time at camp I wandered around shakily, deciding that the next day I would only have two big cups of coffee. But staying in hostels and wandering around with a backpack on, I wasn’t able to make myself lots of coffee anymore and had no interest in drinking the Nescafe most hostels offer. As a result, my time thus far in Albania had been spent with a splitting caffeine withdrawal headache. I sought to put an end to the headache I’d had all day and find a nice cafe to sip an espresso. 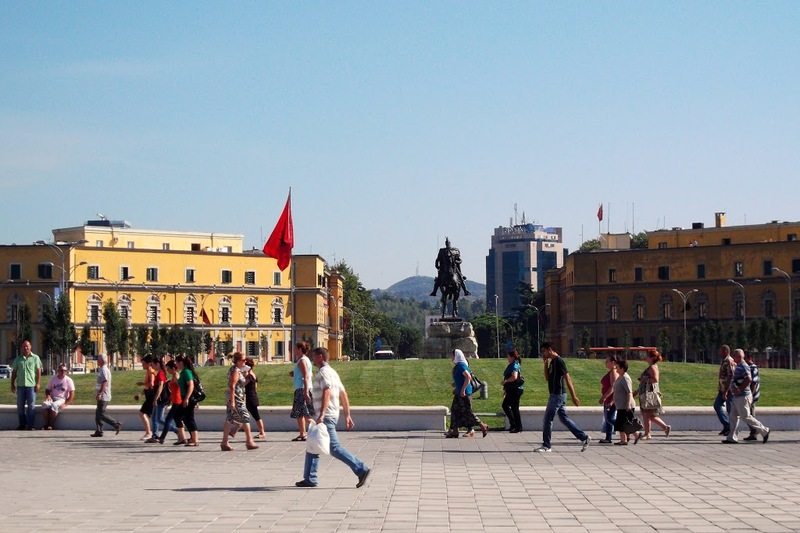 The main square in Tirana is called Skanderbeg place. Skanderbeg (Iskender Bey, Lord Alexander) was a 15th century governor in Lexhe and was an important figure in fighting against the Ottoman presence in Albania. Skanderberg square in Tirana has a big grassy area with his statue in the middle. The square is surrounded by big roads and big buildings. Formerly Skanderbeg square was the location of the Old Bazaar, Orthodox church and Municipal hall, but these were bulldozed to be replaced with the Palace of Culture, the National History Museum and other big ugly buildings. With the cars whizzing past and enormous concrete buildings surrounding the place, it’s an oppressive area. No espresso there. I was given a map at the hostel with the things I should see circled. One of them was the Pyramid, which is up the busy road a bit from Skanderbeg square. 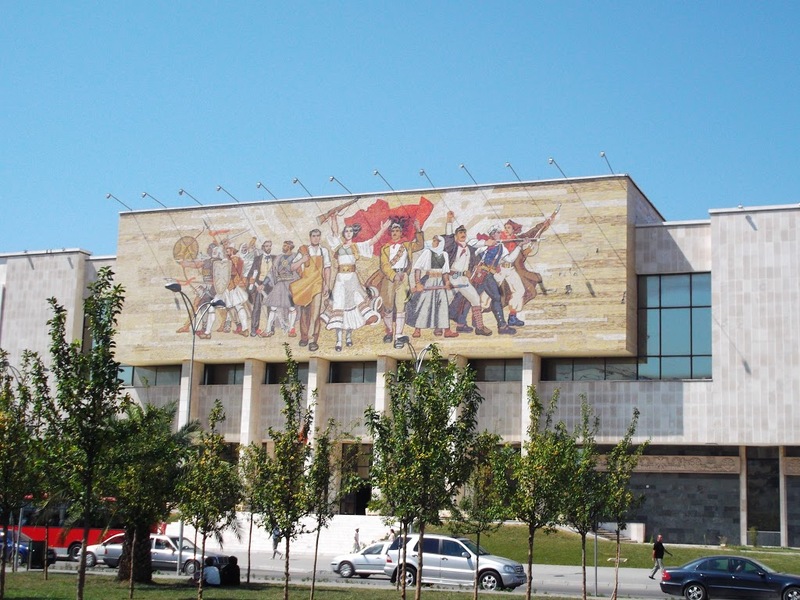 It used to be the Enver Hoxha museum, but is now either abandoned or is a television station or something. Windows are smashed, the whole thing is covered in graffiti. It is truly a ridiculous building. It looks to be more of a hangout for drunks, bums and punks than a tourist site. This main boulevard is a ten lane road. It’s quite busy at Skanderbeg square, but the traffic slowly dies down before it ends. There’s a little turnoff at the end, but it is basically a dead end in an enormous roundabout. It’s like the busiest road leads to something like Taksim square, but then it doesn’t go anywhere else. All the while I’d been looking for a nice peaceful area to sit down and have an espresso. Try as I did, though, I never found a nice, relaxing corner. There’s a river that was also circled on my map as somewhere to walk around, but it’s really just a stream. No relaxing cafes on the waterfront. Everything was big, busy roads with big concrete structures everywhere. And there seemed no point to it. 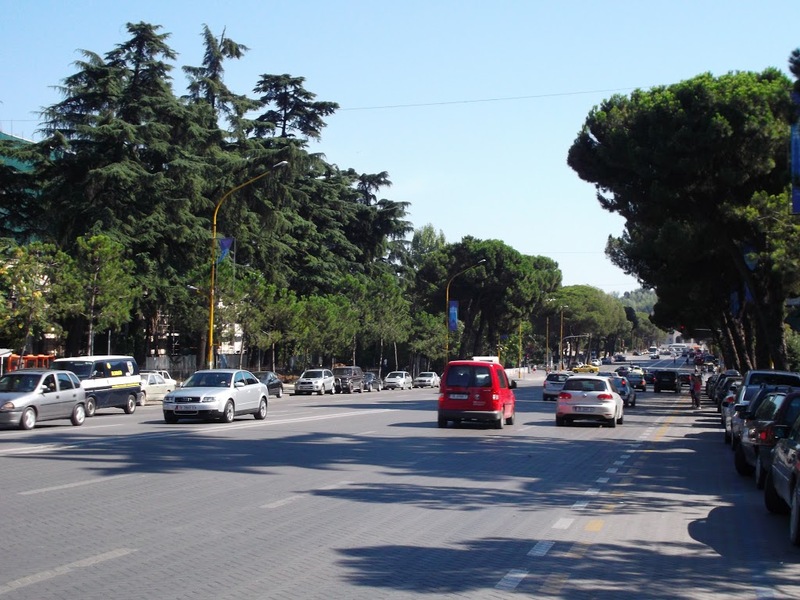 I imagined Tirana justifying itself as a city: We are capital city, big streets and big buildings! Very big! Very cultural! Very much concrete! This was what I had felt about Sofia a few years ago when I was lost wandering around there, except on a much smaller scale. Tirana has fewer than one million people. This was the low point of my trip. I went back to the hostel to sit and ponder to myself what decisions I’d made in my life that had gotten me to this. I could have gone to Bodrum or something! That’s what people do on holidays, they go to nice places! What screws are loose in my head that led me to believe I should go to Albania on my holiday? Why had this been appealing to me again? I briefly entertained ideas of just scrapping my trip and getting out of Albania, going up to Budapest to see friends I hadn’t seen for a few years. The 100km bus ride for some reason had taken three and a half hours, to the capital city. This is a capital city that you basically can’t get in to or get out of because there are hardly any roads in the place. And then I had inquired with the hostel staff about where the bus station was so I could get to Shkoder the next day. But in Tirana there is no bus station. If you want the bus to go to Shkoder you go to one corner of the city, if you want the minibus there you go to another place. If you want to go to Sarande, the bus leaves from one place and the minibus from some other corner. Same thing for Berat or Lexhe or Durres or anything, and it’s always different places. Buses leave from some street corner and minibuses leave from another area. 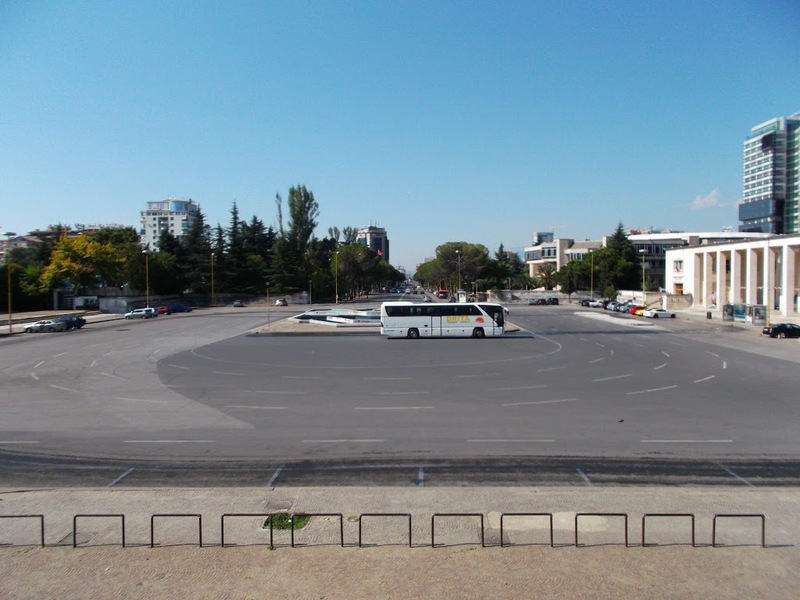 So the capital city of Albania has no bus station. I was convinced that this was my dumbest trip thus far. I thought about the point of my trip, because these frustrations in Tirana were basically exactly what I was looking for. I wanted to have stories like these to tell people about so we could laugh about them. I didn’t like this about myself, that I had gone somewhere essentially to laugh about it. It sounded like Orientalism, or maybe it’s Balkanism or something, but it didn’t seem to be a very positive thing about myself. I went out and wandered around Tirana again and had dinner in a place that wasn’t nice and wasn’t bad. I was happy to be leaving the next day. 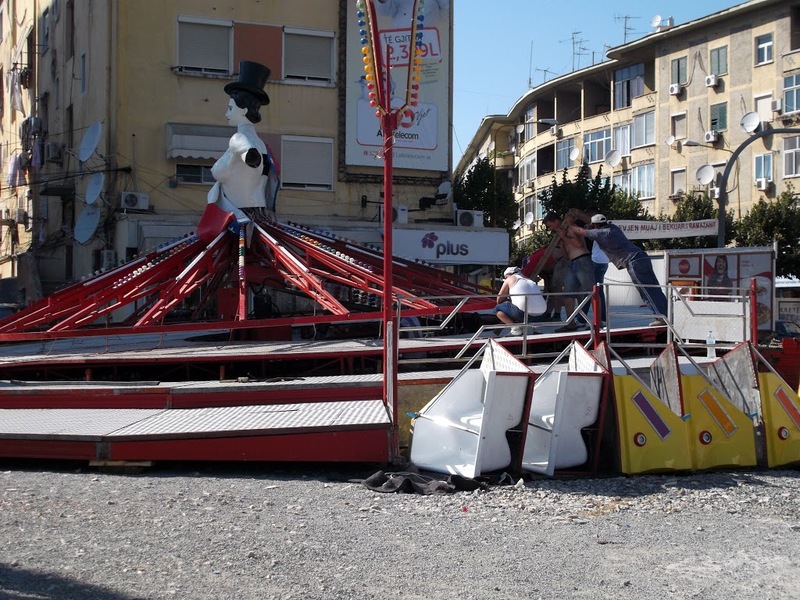 I knew that it was just a snag and that as soon as I got out of Tirana I would start enjoying myself again. 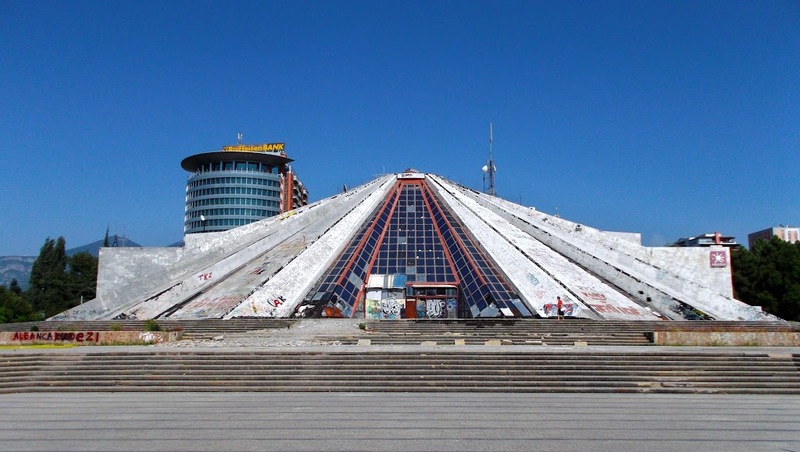 After all, what was Tirana? 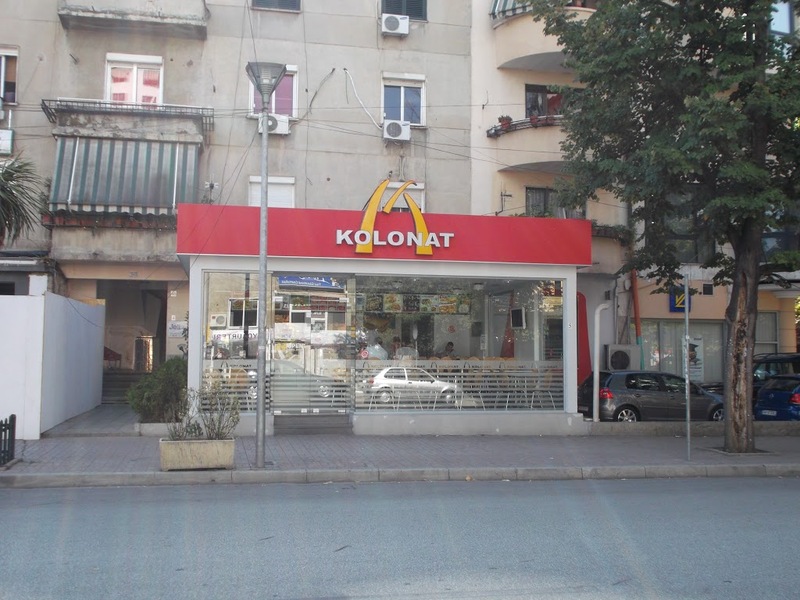 It’s a city with buildings and restaurants and big streets and other things that cities have, except that it’s in Albania so it has Albanian inconveniences. If you’re traveling and want to go to a big city, why would you go to Tirana? Go to Belgrade if you’re in the Balkans and want to go to a city. If you’re in Albania you’re there to see other things. The sea, mountains, things like that. I’d be off the next day and things would get better.Back in the hostel I stayed up talking with a group of Estonians on holiday who were driving to Istanbul and, after stopping in Moldova on their way home, will have been to every country in Europe. I asked about Belarus, but they said that didn’t count. Besides, the border crossing on the road into Belarus takes three days, so if they want to go there they’ll fly in. They said that their friend who had been to Albania five years ago said to take photos if they ever saw a bridge where the water flowed under it rather than over it. Apparently Albania’s made leaps and bounds over the past few years, and my three hour trip from Berat would have been six hours or more a few years ago, from what they had heard. There were four of these Estonian travelers, two guys and two girls, all with pale skin and blonde hair all the way down their backs. They looked like a perfect death metal band. I was up early again to make my way to Shkoder. I headed to the area on my map that was circled for buses to Shkoder. I walked along a huge busy road for about an hour, turning off every once in a while down side streets that I thought might be where the bus left from. 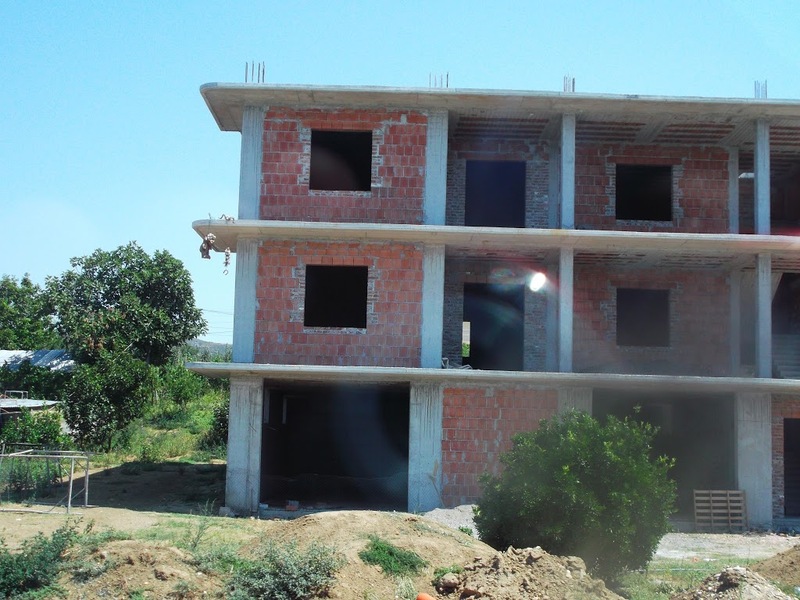 It had gotten hot and sweat was dripping in my eyes, so I figured I wasn’t going to find the place and asked a taxi driver to take me to the buses to Shkoder. He pointed in the opposite direction to where I had been walking and drove off. So I turned around and when I got to the next big square asked another taxi driver to take me to the bus station to Shkoder. He pointed to his watch and said, in broken English, that if I waited here for a few minutes, the minibus to Shkoder would pass by. I waited for about twenty minutes and saw minibuses to lots of other cities, but nothing to Shkoder, so I picked up my bag again and walked back to Skanderbeg square, where I’d been more than an hour and a half earlier when I had set out looking for this mystery bus. I finally found a cab driver who spoke German who both knew where the buses to Shkoder left from and agreed to drive me there. We drove down backstreets that I never would have found, onto a dusty alley that was definitely not what was circled on my map as the bus station, where there were two buses and a bunch of old ladies waiting to get on the bus. I was glad to be heading out of Tirana. I decided that having seen Tirana, it didn’t make much sense to try to make it back there to head to Berat again to try to go to the Bektashi shrine. I’d just spend the rest of my time in Albania wandering around up north. I figured that with the disorder of the buses in Tirana it would be best for me to not come back here to look for a bus to Istanbul, but find some other way to get out of Albania without passing through Tirana again.